I am happy to introduce you to a new romance series by Kylie Hillman. Conan is the first installation a new spin-off from the series Black Shamrocks MC -which was pretty awesome! So if you love steamy romance novels, that won’t let you go until the last page, then this is the book for you. And of course, don’t forget to enter in the giveaway at the end of the post, for your chance to win your very own copy of Conan! Kylie Hillman is the Australian author of the Internationally Bestselling Black Shamrocks MC series, Amazon #1 Bestselling NA/Sports novel, Brawl (Black Hearts MMA #1), and the recently completed Centrifuge Duet. 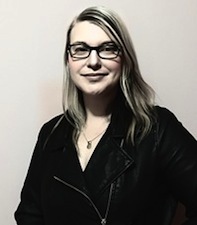 She’s currently working on the highly anticipated spin-offs to the Black Shamrocks MC series, writing the rest of the Black Hearts MMA series, and plotting her upcoming psychological thriller, Blood Oath. She’s also wife to a Harley-riding, boating and fishing, four-wheel driving, quintessential Aussie bloke and mum to two crazy, adorable, and eccentric kids. A Crohn’s Disease sufferer and awareness campaigner, as well as an avid tea drinker, metal head, and math nerd, Kylie is known for lacing everything she says with sarcasm and inappropriate innuendo.